During the warm summer in northern California, I try to maximize any and all time outdoors. Cooking food on the grill gives me an excuse to sit outside, sip wine, eat snacks and chill while the deliciousness transforms. This recipe for grilled chicken takes about 45 minutes to marinate and another 45 or so to cook so it’s more relaxed weekend fare rather than hectic weekday. Unless it’s vacation, and that’s even better. The citrus-based marinade features acid from lemon juice which penetrates the chicken’s meaty fibers and pulls the bright flavors all the way through. If you skip the long marinade time, it will lose some of that goodness so stick with the recipe. It cooks best if you use bone-in chicken but if you choose boneless, reduce the marinade time to 30 minutes and reduce the grilling time by about 30 minutes. Serve with grilled corn, summer squash or zucchini = no clean up. Wine? A light, crisp, lemony white wine like Sauvignon Blanc or Pinot Gris. All the white wine reviews on this site. 1. In a gallon-sized ziploc, combine all ingredients. Close and shake well to mix and spread evenly across all the chicken breasts. Marinate 45 minutes in the fridge. 2. In the meantime, coat grill with cooking spray and preheat the grill to medium high. 3. Place chicken breasts, bone sides up, on the grill. Sear 5 minutes and then reduce heat to medium low, close the grill and cook 45 minutes, turning chicken every 10 minutes and basting with remaining marinade. If the skin gets too dark, reduce heat even further. 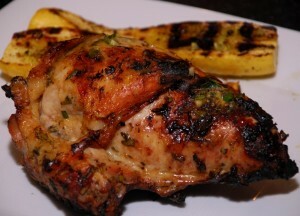 Chicken is done when a thermometer registers 165 degrees when inserted into the thickest part of the breast.